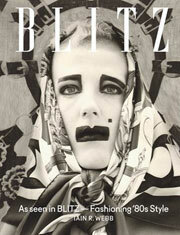 In July 1986, BLITZ published an issue featuring images of 22 Levi’s denim jackets that had been customised by some of the world’s most lauded designers – Vivienne Westwood, John Galliano and Katherine Hamnett among them. The jackets went on to be worn during a special evening of performance, and were displayed at the V&A. BLITZ founder and publisher Carey Labovitch and the magazine’s fashion editor Iain R Webb speak about the thrills of setting the magazine up, its unique editorial approach and give us the full story behind the designer denim jacket project. Jackets from the collection are currently featured in the Club To Catwalk exhibition at the Victoria & Albert Museum in London.